The Angry Birds series of video games concerns a species of off-color pigs driven to commit acts of ritualistic infanticide against several species of alarmingly mutated birds. In response to this unrelenting aggression, the avian protagonists mount an unending campaign of suicide attacks designed not simply to kill but also to destroy all vestiges of porcine infrastructure as a measure of revenge. The movie makes less sense. There was a moment — it has passed, but that never stopped a movie studio — where the Angry Birds series was moving a lot of merchandise. Shirts, stuffed birds and pigs, board games, coloring books; despite the relative simplicity (and, it must be said, unoriginality) of the game, the marketing was undeniable. So why not a movie? Admittedly, the financial and meritorious success of The LEGO Movie proved that films based on commercial interests can still be worthy in the right hands. But The Angry Birds Movie is far, far away from the right hands. 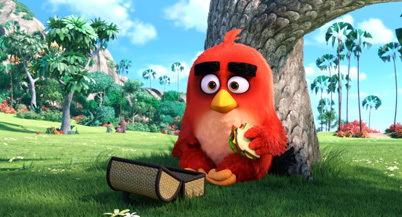 Directed by a pair of rookies — Clay Kaytis and Fergal Reilly, both of whom have experience only as members of animation departments — and written by TV veteran Jon Vitti, The Angry Birds Movie has shockingly little respect for the intelligence of its young audience.